MotoGP is back in America once again, running at truly ridiculous speeds all weekend at Austin’s Circuit of the Americas—and we here at Jalopnik are here for it all. What would you like to know about some of the fastest, most insane two-wheel racing on the planet? If you’ve never gone to a MotoGP race before, it’s something you need to experience. It’s always a treat to see these guys lean way, way over in turns and then pop up to accelerate at truly unbelievable speeds down the straights. Nothing but some of the most advanced motorcycle racing gear on earth keeps them from the world’s worst high-speed road rash, but it’s all pretty effective for some of the big, dramatic slides these riders take when they get it wrong. Races are short, but action-packed, coming in at about 45 minutes for the main 21-lap MotoGP race, which takes place at 2:00 p.m. local Central time on Sunday. Riders run close to each other and aren’t shy about getting up in each others’ space. MotoGP bikes are purpose-built racing prototypes not made for road use, with a maximum engine size of 1,000 cc. 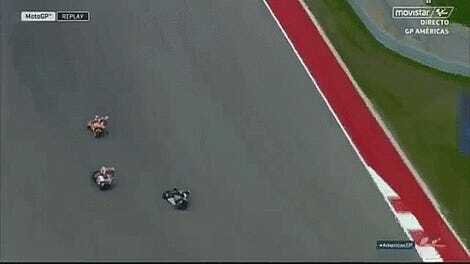 So far, Marc Márquez has won every single MotoGP race at COTA. He hasn’t been doing as well this season, though, so will this be the year that someone else finally wins this race? Of course, MotoGP isn’t the only group running here this weekend. United States-based series MotoAmerica kicks off their season at COTA this weekend, plus MotoGP’s usual support series Moto2 and Moto3 are here to run as well. You can check out the full weekend schedule here. Erik Schelzig, Alanis King, Jason Channell, Kurt Bradley and I are here to experience the madness firsthand and see what it’s all about. We’re on the hunt for cool bikes, fast riders, hilarious fan questions about ducks asked in the MotoGP press conference (which is a thing!) and whatever else we can find that’s interesting. We’re here for you guys, though, so what would you like to see? Are you also here in Austin this weekend? Let us know in the comments where you’ll be watching the race from, and don’t hesitate to say hi.